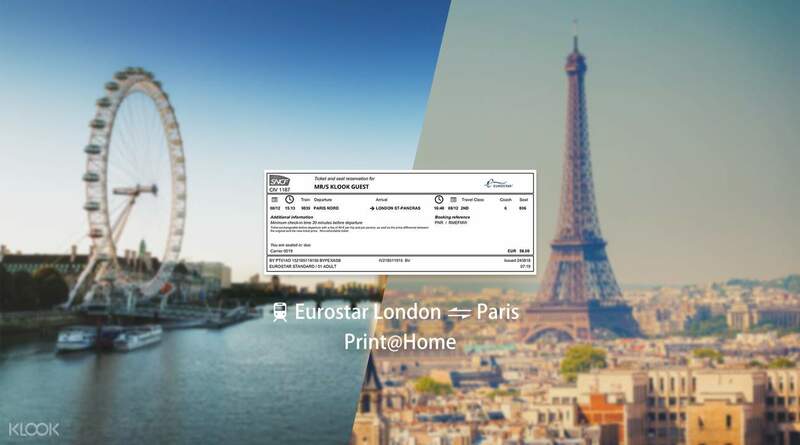 Instantly receive your e-tickets when you book Eurostar trips via Klook's Europe train ticket booking page! Traveling at speeds that reach up to 186mph, traveling between the two cities will only take you just over 2 hours! With trains that depart as early as 5:40am from London and 6:43am from Paris, same-day returns are doable! Get 2For1 entry to the top galleries and museums within 5 days after you arrive at your destination! Great way to travel from London to Paris. Easy and convenient. Ever wanted to enjoy a laid-back breakfast in London, then spend the rest of the day exploring central Paris for some gourmet cuisine and shopping, before going back to London to experience the unique nightlife - all without having to go through busy airports and sitting in crowded planes? With the Eurostar train services between London and Paris, you can do just that, and vice versa! Traveling at speeds that reach up to 186mph, you'll be able to make your way from one city to another in just a span of over 2 hours. Simply select your preferred travel date and departure time range on the Klook website/app, then wait for us to e-mail you with more details. Once we confirm that your selected ticket is available, or if you accept the alternative ticket, we'll send your e-ticket via e-mail, which you'll need to print on an A4-sized paper and present it along with your passport during the day of travel. Remember to arrive at least 30-45 minutes before the departure time on your ticket so you don't miss your train! The best part? You're allowed to bring two pieces of luggage and a small piece of hand luggage, so you won't have to worry about packing light, and you'll also enjoy 2For1 entry to the top galleries and museums at your destination. Pro tip: you'll be able to get cheaper seats if you book earlier, so make sure to plan ahead! Enjoy quick and convenient travels between London and Paris with these Eurostar train tickets! You need to present your printed ticket and a valid passport to board a train. Never leave them at home! You must check in at least 30 minutes before the departure time indicated on your ticket (45 minutes during peak season, weekends and public holidays.) The ticket is valid only on the date and time specified, so please budget your time wisely so you don't miss the train! A very convenient to travel from our hotel to train station and we just show the our vouchers to change to the actual tickets and the journey run smoothly. A very convenient to travel from our hotel to train station and we just show the our vouchers to change to the actual tickets and the journey run smoothly. Great way to travel from London to Paris. Easy and convenient. Great way to travel from London to Paris. Easy and convenient. This is so convenient and fuss free! Klook representative came back to us with a timing which I had requested for within 1 hour of my booking. Plus with a promo, we got it cheaper than anywhere else outside! Highly recommended! This is so convenient and fuss free! Klook representative came back to us with a timing which I had requested for within 1 hour of my booking. Plus with a promo, we got it cheaper than anywhere else outside! Highly recommended! This is just so much more convenient as all you need is to print out the ticket and scan it at the airport. This is just so much more convenient as all you need is to print out the ticket and scan it at the airport. For leisure travellers with no fixed or urgent timing to get to Paris as Klook do not allow you to choose the train timings (only allow selection for morning, afternoon or evening-night trains). For leisure travellers with no fixed or urgent timing to get to Paris as Klook do not allow you to choose the train timings (only allow selection for morning, afternoon or evening-night trains). You will need to get to the 1st floor for the departure from Paris to London. Clear both, Paris and UK immigration. Train depart on time. Smooth journey. You will need to get to the 1st floor for the departure from Paris to London. Clear both, Paris and UK immigration. Train depart on time. Smooth journey. Fuss-free and very convenient. Highly recommended to get this. Fuss-free and very convenient. Highly recommended to get this. Nice discount, though the timeframe given is a bit too wide, only 3 available. Nice discount, though the timeframe given is a bit too wide, only 3 available.